8"x 6" oil on canvas panel $150. SOLD. This is from a photo I took in the car. This is lovely, Julie. Yeh, we've seen enough snow in Spring here. Happy Easter! That's amazing. So many times I see something I know I'll likely not see again and I can't get off the road to get a photo. Then there's the photos I do manage to get, try to paint and they come out yucky.....we learn more from the failures though. Winter just doesn't want to leave. If I was in this beautiful painting, I wouldn't want to go either! Lovely Julie. Wow - I think this is outstanding and one of my favorites. I love the subject and the fact that someone is home and has turned on the lights. Its magical, Judy. 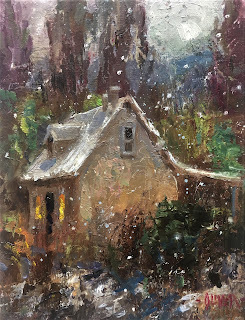 Ah that could have been a painting from my part of the world this morning...it was spitting snow just after a lovely warm day in the 70's yesterday. I just love this painting friend. Hugs! What a charming little cottage, Julie. The paradox of snow falling after the trees have budded is frustrating to many. That happened every so often in Washington State where I grew up with pear and apple blossoms. The devastation of not having pears to can or apples to make into sauce was hard for many.